About four months ago four of us (Jon Glover, Tery McCowan, Sarah McCowan and myself, Jess Whistance) decided on a whim to enter the Glencoe Mountain Gathering Half Marathon. We all have children, jobs, busy lives, and collectively no running experience, so it was more than a challenge. In October 2014, 17 family and friends headed to Kinlochleven to support us on our half marathon and we absolutely loved it. So much so that we decided to set up Team Applecross Running Club. We now have between eight and twelve regular runners which is no mean feat in a community of just 232 people. Our ages range from Millie, my daughter, aged 12 to Gerry McPartlin aged 71 years. Out of the four of us, Tery and Jon will be running the Tiree Half Marathon in May 2015. Sarah and I, and Gerry McPartlin are running the Virgin Money London Marathon on 26 April 2015. We will also be running the Wilderness Challenge August 2015, a 25 mile event over mountainous terrain. And we will be running the 10k event in this year’s Glencoe Mountain Gathering with Millie. Our training has meant many hours over the hills of the Applecross peninsula in the north-west Highlands, where we live. 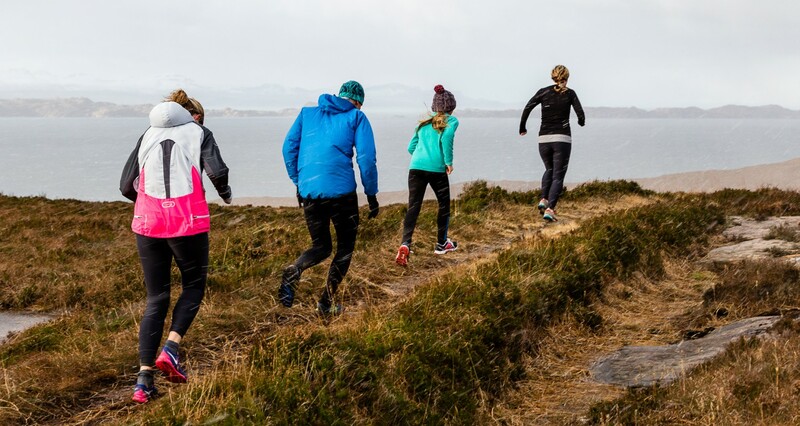 We have seen places we would never have discovered, made life long friends and new friends, developed an unhealthy obsession with running kit, and seen an enthusiasm for running spread throughout Applecross. We have found that in the last four months that our energy levels have rocketed, we are fitter, healthier and still very enthusiastic. So we wanted to share our training highs and lows, fundraising events, challenges and how our lives are changing simply by running and getting outdoors.